Did you see this on Saturday? It really made me laugh… I mean, yeah it’s not all about shopping, etc (quoique…) but once in a while, it just feels good to go for it just because we want to! 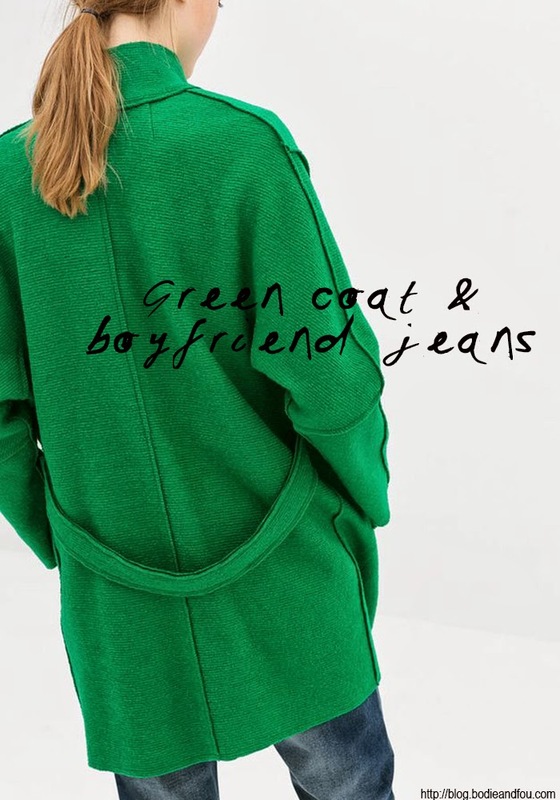 So I got myself this very bright green coat from Zara to wear with my boyfriend jeans and my black Bowie’s Suede Wedged trainers. I don’t think I ever bought anything so bright since Uni but I had actually seen someone trying it on, in a more conservative colour last weekend in Westfields and thought the cut was really good. It looked so good on her that I almost told her. So when I saw it in green, I just thought…why not!!? 2014 feels good, really good. I have a huge amount of energy and like our pink door, this will be my happy coat for this Spring. What do you think? What’s the brightest piece of item you bought? 2/ For a casual look at weekends, I’m loving this Breton striped t-shirt from Coogles but am I right in thinking they got it wrong…one says Breton not Brenton! 3/ I love these aqua chinos for men. Steve bought me a pair from Scotch & Soda last year for Mother’s Day and they are fantastic to wear. 5/ and last week, I spotted these adorable Aigle Aqua gum boots for children! Mila has them in navy but I think we will go for aqua or pink for her next pair. Each time, she gets a new pair, we change colour and then I keep them for styling some of my shots. Love Green color in all the shades there are. This one I call grassy green is actually one of my favorite. I think I’m going to end my black & gray phase to. It’s bit boring allready. I’ve started running to, there is still some time to fix things bifore bikini time ;). My coat has arrived at Westfields Zara so I’m going to pick it up tonight and then complained about all the linen t-shirts I got from them and they all have holes!